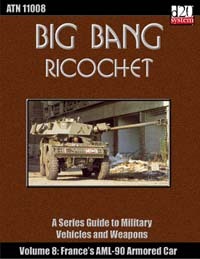 This is the first French entry into the Big Bang Ricochet product line, covering the Panhard AML-90 Armored Car. The AML-90 is a well distributed military vehicle, with over 6,000 units serving around the globe, particularly in the second and third world nations of Africa and Central and South America. Rugged and armed with a 90mm cannon, the vehicle is well suited for the underdeveloped wilds of many of these nations. The vehicle serves mainly asreconnaissance and internal security vehicles, though a number of nations do use them as their primary form of armor in place of tanks. France itself used the AML-90 up until about a decade ago, when it was replaced by the newer AMX-10 fleet of vehicles, though some AML-90’s remain in service as a French contribution to UN peacekeeping efforts. The most prominent use of the AML-90 to date was its use in combat by South African forces against Cuban forces during the Angolan Civil War. This book details four distinct versions of the AML-90, as manufactured or rebuilt by Argentina, France, Ireland, and South Africa. Also included are writeups of the GIAT CN-90-F1/DEFA D921 90mm low pressure tank gun and the MAS/GIAT AAT-52 machine gun.